Seeing as we're talking about Round 12, I'd be wary of loading up too much on Origin players, particulary forwards, given we already have Teddy, Arrow, Macca, Morgan, maybe Murray there. (Morgan and Macca at least are probably sells before Origin. It's a mark against Crichton who might be managed rnds 12-18, less so Ponga but it's worth thinking about because we could be losing a lot of points targetting a Crichton (or Klemmer) over a Surgess, Lolo (when back), Bateman or Kikau even if he is undervalued. 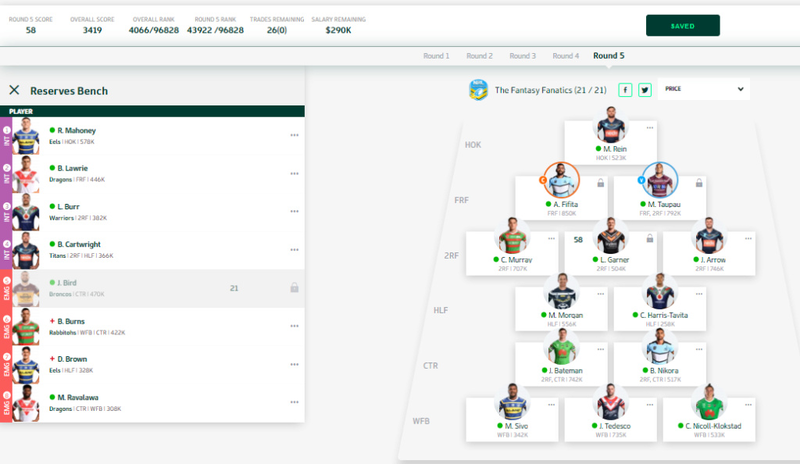 Someone else I'd mention as a trade-in/watching brief is DWZ who is more playable than Sivo/Rava in the third WFB spot, or also Wighton and Guth are DPP and Round 12 if we don't go the Ponga route. Tldr, Bateman the priority, consider DWZ if that means missing Ponga this week. Yeah man, I agree with the Origin/Round 12 stuff. I've been a bit concerned about my own team that all the 'value' guns Im bringing in / wanting to are Origin bound...Does make Bateman particularly appealing for this team. Looping this week ended early. We will not play Bird for 21. Will back Carty and CHT to better that. Starting lineup is now set. 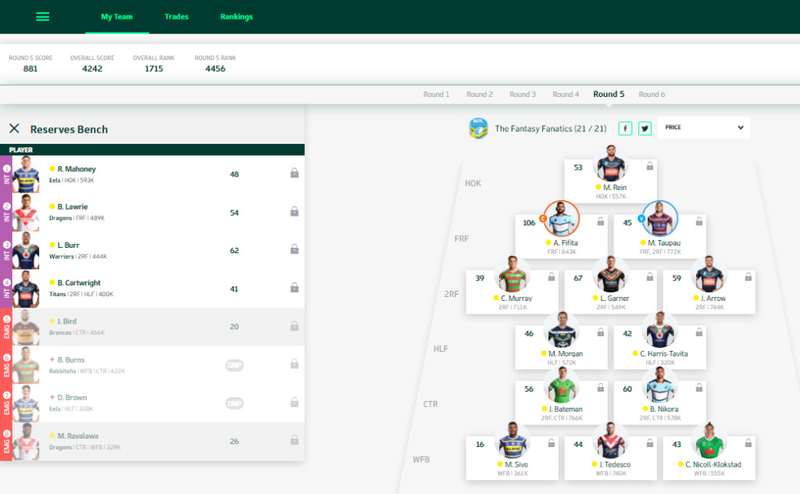 Easy trades next week as far as I can see to bring in Ponga (to cover 3rd WFB) and Haas (he averages 68). After that I'll start looking more at the byes I promise. The outs are a little more difficult but I'm already thinking Brown and Bird but will wait until the weekend is through to see what happens. 881 was a solid yet unspectacular result that I think we can be pretty happy with. 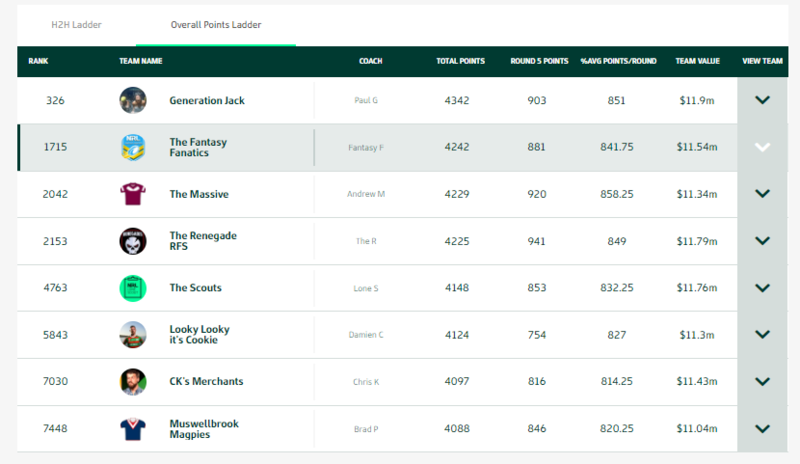 1,715th overall (267 points back), 2nd in the celeb league (100 points back) and 50th in the FOG (253 points back). Fairly good week this time wit only 1 coin flip going against us. - Being wary of Bird paid off this week as we avoided his score and played Carty and CHT to great effect. - Captain Fifita was going really well until his untimely hammy injury. - Ravalawa would have netted us 10 points over Sivo but thats always a tough call. Doubt many would have predicted an Eels shutout and a the Bulldogs going down by 36. 26 trades to go with 290k ITB puts us in a good spot this week. - 4th bench spot (Bird/Carty/CHT). - Murray and Arrow are at the top of the 2RF scorers currently. We don't gain any massive benefit trading them (<2 points a round) so we should keep them. Personally I think Murray's true average is sub 50 when his attacking stats aren't as frequent but until rd12 he probably wont move the cash needle enough to consider trading. By then we will know if he is or isn't a keeper. CNK and Morgan could be final 17 members if we are truly desperate (DCE/Munster/Cleary or RTS/Ponga adds 10-20 points a week). We need to sell these guys eventually but they aren't a priority and cover weaknesses in our squad currently. This list would suggest Twal, RTS, Klemmer and Ponga are cheap now and should be our first targets as they have the most cash to make if they sustain their averages (or Ponga 50+ back at FB). However this doesn't take into account getting Cook/Farah as a captaincy option giving us extra points for captaincy. DCE will come back to earth a bit. A more affordable Cleary/Munster combo saves 150k (a trade) and all should score similarly. Arey is also an option if we risk injury. Ditching one of the hookers would also save cash but would be quite a hit to our scores. Thanks to MTB we know Haas has a -15 BE and will plug a hole for our 4th reserve/short term Fifita cover. That's my obvious trade in this round. Xerri is the only other cash cow I'd look at but CTR isn't a spot we need help in nor is he a consistent bench option. He'd only be an option if we want Cook next week and sacrifice points in this one. I'd say its a toss up between Cook (Low BE and great captaincy option), RTS (fix 3rd WFB and best scorer), Ponga (fix 3rd WFB this week and when Burns returns go to HLF) and Twal (most cash to make on keeper status) for the other. The big problem is who do we get rid of to achieve this. Cook requires more cash than any combination of Burns, Bird and Brown can provide whereas the other all affect our team balance. 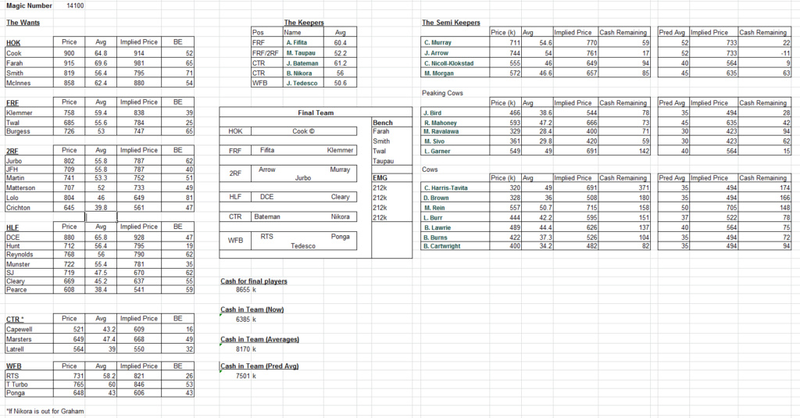 If it was my team as Bird lost cash this week and Brown is out indefinitely I'd get rid of them. Personally I feel we have committed to Burns for long enough that we hold him for his return in 2/3 weeks and play him at FB then. Ponga would cover WFB till then and afterwards move to the halves. If we get news that Fifita's injury is serious and could be out for multiple weeks I would likely do Fifita to Cook and Bird/Brown to Haas. But as always I'm interested in hearing others thoughts. What would you do with this team? Good point but as to who that is I have no idea. Take 1 million as funding the dream team with another 400-500k for an 18/19th man required. Either way we need a lot more cash. I guess I'm trying to point out that buying guns at their peak (Cook/DCE) isn't really feasible while we are looking at such a massive funding hole. Also an 18th/19th man is ideal but the trades spent to get the cash for them couold often be better used just trading as injuries/suspensions strike so there needs to be a balance. The other option is getting on late season cash cows like Fonua and Martin of last year who started at 212k or close and became those midrange options. Brown has to go for a cow. Is here a better cow gamble than Haas? I'd try and save the other trade this week depending on injury news. Some may want to get rid of Bird but he is only two tries away from good scores. Haas is the most urgent trade in. Won't see a better cashie the rest of this season. Twal is the next most urgent trade in, lowest BE and a keeper that can average 60 for $685k and doesn't play origin is a no brainer. The others like him are all $800k+. He is proving what we anticipated coming into the season, with such a high PPM, given minutes he has excelled. For halves you are missing SJ, currently at a discount and also doesn't play origin. @mattnz wrote: Haas is the most urgent trade in. Won't see a better cashie the rest of this season. I agree on Haas. Will be like Kikau last season but practically guaranteed 200k in rises from here at a minimum in my eyes. SJ still on a high BE so plenty of time to look. I certainly don't mind picking him up in a few weeks. Yeah looks good guys - 100% Haas in (for Bird) and then my vote would be for a third WFB (even though I agree with Matt that Twal is a big target) I think its more urgent for us to fix that last WFB spot. Great disection guys, I'd go Haas and RTS as the next priority. Main forum also said Ryan Sutton could be worth a look and I tend to agree. He is likely to get DPP after this week and job security is fairly good with Tapines 12 week injury. Also plays rd 12. Base is about 42 points (30 tackles + 120 run m) and till his last game kept the negatives pretty low. I see him making less points and $s than Haas so I don't think he's an include over him but tempted by him for sure. He's bottomed out already after starting off the bench in limited minutes. I'm tempted to get him in over Ponga/RTS but our 3rd WFB is pretty dire. Probably has 130- 160k in him but the first 30 should go this week. I'll keep him shortlisted for this team next week. Likely should have had him in the trade poll but completely missed him myself. Im interested in Sutton, but I don't think he adds to our total points as much as dealing with the WFB spot. Watch list for sure and if he goes 45+ this week again then he is a serious option next week IMO.